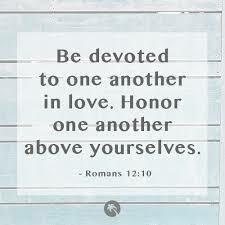 This week we will continue in our series on Romans 12 by looking at verses 10-13. A story is told about a man who was walking down the street. He passed a used book store, and in the window, he saw a book with the title, “How to Hug”. He was taken by the title so he went in the store to buy the book. To his chagrin, he discovered that it was the third volume of an encyclopedia that covered the subjects “How” to “Hug”. The church is a place where love must be clearly seen at work. When people come looking for for a demonstration of love, we don’t want them to find an encyclopedia on theology. We want them to see Jesus’ love pouring out of His people.